Paneer is an unsalted white Indian cottage cheese that is used in a range of Indian dishes. Paneer recipe is the simplest and easiest dish one can ever make. 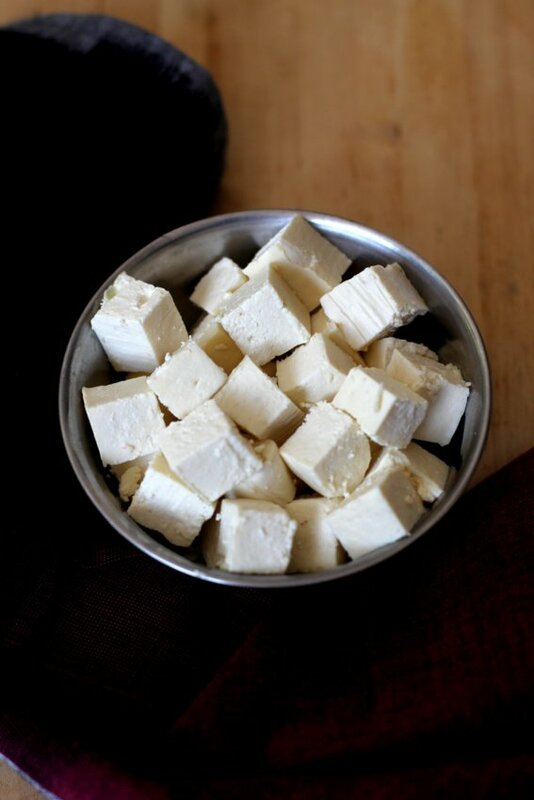 Homemade paneer is the best as its fresh and soft. 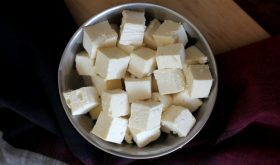 If you have been buying store bought paneer, I urge you to try making your own paneer at home as there is a lot of difference in texture and taste. Full fat milk that is boiled is curdled by adding an acidic medium like yogurt or lemon juice and the resultant milk solids are drained of all its liquid before it is set to harden. 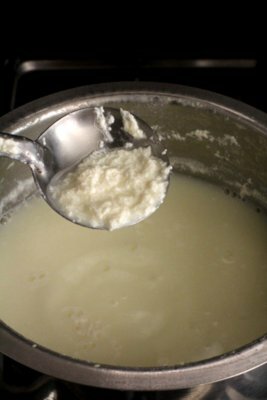 The best curdling agent is curd aka yogurt as it yields soft and creamy paneer compared to the paneer prepare with lemon juice or vinegar. If I have to prepare paneer recipes like paneer kheer, rasgulla and rasmalai, I allow the excess liquid to drain completely and use it right away (i.e after Step 7 below) To prepare dishes like paneer burji, paneer kulcha, paneer paratha etc, I place a weight over the drained chenna for only 10 mts so that it holds shape and some moisture is retained in the paneer. For dishes like paneer butter masala, matar paneer, palak paneer or any gravy based dishes or chilli paneer, I place a weight over the drained chenna for a longer period of approx 30 to 45 minutes so that it fully sets and is easy to cut into any shape of our choice. You can prepare flavored paneer by adding spices and herbs of your choice while making the paneer recipe. At the time of curdling the milk, you can add finely chopped mint leaves or coriander leaves or crushed black pepper or red chili flakes. You can even add cumin seeds, kasuri methi, roasted garlic or Italian herbs. Heat milk in a heavy bottomed vessel. Bring to a boil and reduce flame to low. 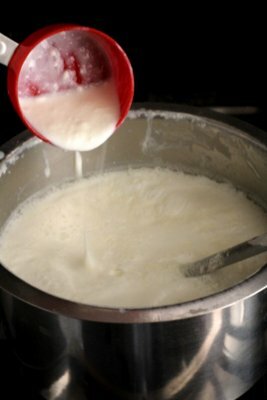 Whisk the curd well and very slowly add it to the hot milk and keep stirring continuously. Do not add all the curd at once. Add a little at a time and keep stirring. You will find that the milk would start curdling with milk solids start forming along with a greenish color thin liquid called whey. 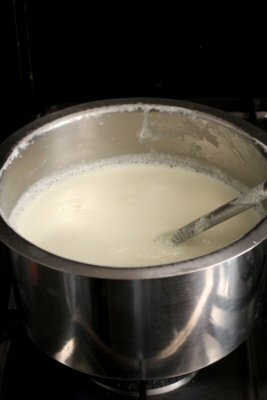 If the milk is not curdling after adding the entire curd, do add another one or two tbsps of curd to curdle it. Turn off flame. Immediately add 8-10 ice cubes to the vessel to stop the further cooking of the milk solids. Adding ice cubes at this stage will give you soft paneer otherwise it might be hard and rubbery in texture. Allow to rest for 5 mts. Take an empty vessel and place a sieve over it. Cover the sieve with a wet muslin or cheese cloth and pour the curdled milk into it. The whey will collect the bottom of the vessel and the curdled milk solids(called chenna) will remain on the top. Set aside the collected whey that can be used to knead chapati dough. 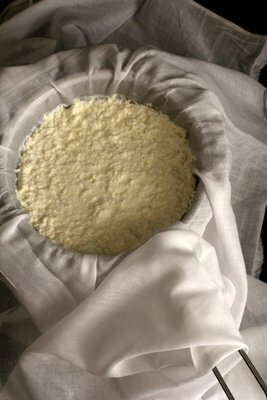 Bring the edges of the cloth on all four corners and gently squeeze the milk solids (chenna) once or twice so that excess liquid is removed. Now tie a knot so that you can hang it at a height for the excess liquid to drain. Leave it aside for 30 mts. Now remove the knot of the muslin cloth and place the chenna along with muslin cloth on a wide plate. Gently press it to form a rough square shape. Place a heavy weight over the chenna for it to harden. 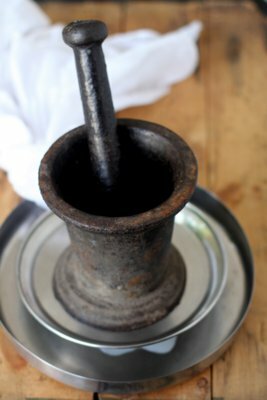 I used an iron mortar and pestle. Heavier the weight, lesser the sitting time. Allow the paneer to set in 20-30 mts. It should set enough to hold shape so that we can cut into pieces. 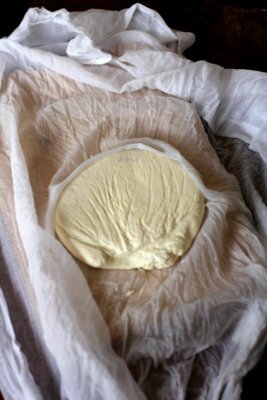 If you allow the weight to sit for a longer time, you will have a hard textured paneer. 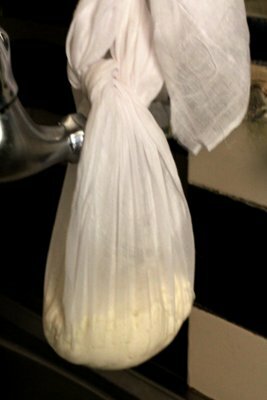 Once the paneer is set, remove it from the muslin cloth and cut it into any shape of your choice. At this stage you can use it right away to make tikkis, curry or any snack. If you are not going to use it immediately, place them in a ziplock bag and freeze them. An alternate method to curdle the milk is to bring milk to a boil and turn off flame. Slowly add the curd and allow the milk to curdle stirring continously. 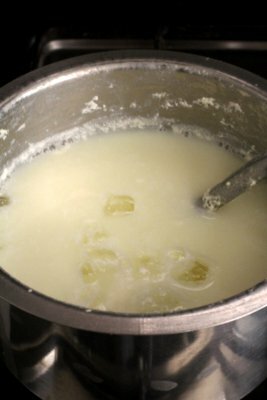 You will see small milk solids and a greenish liquid is formed. Immediately add ice cubes to stop it from cooking any further. 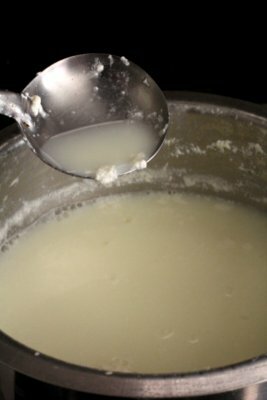 If using curd to curdle the milk, use room temperature curd as cold curd might take a longer time to curdle and it might not curdle properly. Use whole milk for best results but even 2% or 3% milk is equally good to prepare paneer. 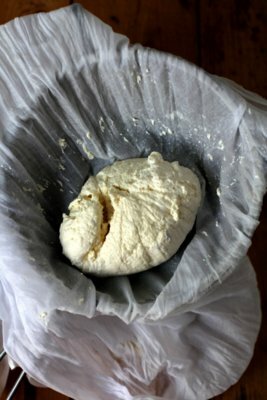 Curd is best for a soft and sour free paneer. You can also use lemon juice and vinegar in its place. Use freshly squeezed lemon juice and not the bottled lemon juice. The left over whey can be used to knead chapati dough, gravy dishes that call for water as well as boil rice. I used a very heavy weight so the sitting time was less. If you are not using a very heavy weight, allow the paneer to set for at least 1 to 1 1/2 hours. To soften hard/rubbery textured, place it in warm water for a couple of minutes. For frozen paneer, place it in hot water for a couple of minutes and the paneer will turn soft.